A robust, non-folding treatment table for use in hospitals, surgeries and clinics. 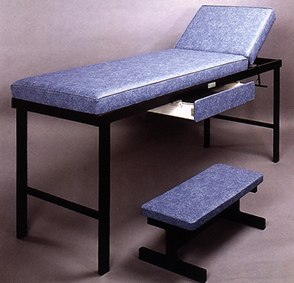 The Examination Couch is a solidly constructed treatment table, complete with adjustable headrest and deep foam mattress. The couch upholstery is available in any colour from the Chieftain range of flame retardant vinyl fabric. A drawer unit and step are available as optional extras.